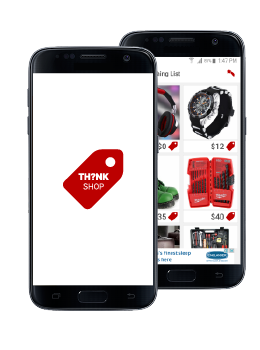 ThinkShop is the app that takes the thinking out of shopping by enabling you to maintain a wish list of anything you desire. Your family, friends and loved ones can then view your wishes and contemplate a gift for you. Spontaneity rules when using ThinkShop! ThinkShop encourages you to gift your loved ones any time for any purpose, and not just calendar based events. Consider the opportunities to reward family or friends for any achievement, special occasion, to gift in times of joy or sorrow, or just to show you care. Gifts can even be non-monetary eg. A place you would like to visit or an experience you would like to feel! Nothing beats a surprise gift, and it’s even better when it’s something you really want. ThinkShop – think it, pic it, add it! Help you answer the proverbial gift giving questions of “What would you like?” and “How much does it cost?” Stop thinking and start shopping! Avoid having to subtly hint, overtly explain or embarrassingly ask for what you would like to receive as a gift. Create your wish list and let family and friends have line of sight without feeling the need to ask. Avoid the boring and thoughtless gift giving suggestions of cash or gift cards. Show you really care by buying the right gift that’s going to make them smile for quite a while. Reserve gifts for friends, it’s first in best dressed, and they won’t know it’s reserved so the surprise element remains. Assign wishes to a very special someone using Private mode. Could be a gift, a need, a desire or a dream. Nothing is more special than a surprise gift from a loved one. Spontaneity just got a whole lot more exciting, so go ahead and add wishes that cost nothing but are worth everything! Reward a family member for a major sporting achievement, personal best, academic excellence or any milestone that shows how much you care. Kids can build their lists and Parents can enjoy gift giving any time of the year for any purpose. Invite family and friends to join ThinkShop so you can show and share each other’s desires and wishes. Elegant Media 2019 © All rights reserved.